The latest from Joomla Bamboo has been released and I know I am a day or three late, but I was moving the site to Joomla 1.5 and I didn't want to put it up half way through the move. Okay, that's not a great excuse, so apologies, but it is all you're going to get. This new theme is called Sketch and it's coined as 'ideal for your blog, folio or creative business portal. Its innovative, hybrid design lets you have your cake and eat it with style'. I'll add to that and say it could actually be used for many more things. 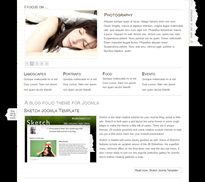 The theme is only for Joomla 1.5 but that is very much the case these days. Theme providers are limiting themselves if they also provide for Joomla 1.0, in so much that the version for Joomla 1.0 might not have the features and the work involved in creating two separate themes each month, probably isn't worth it. But this theme is absolutely lovely. Very different to the one from last month but lovely all the same. It has 30 module positions, seven different colour themes included in the theme and if you want to get the theme up and running just like the demo site, then you also have what Joomla Bamboo call, a quick start package. Enough of me though, it only takes a click to go have a look.